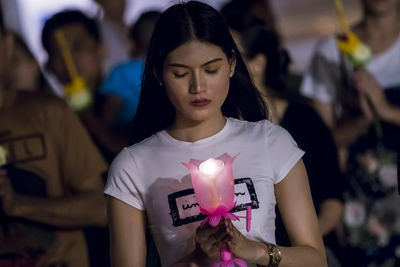 Makha Bucha is a Buddhist holiday celebrated in Thailand each year on the full moon of the third lunar month. 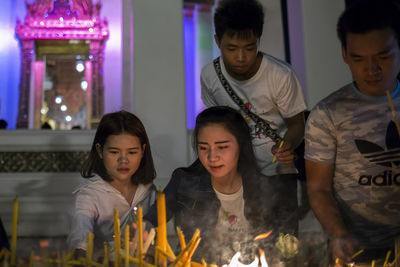 On this day, celebrated in temples (Wat) nationwide, Buddhists gather to show respect for Buddha and take part in merit-making activities. The spiritual aims of this day are to do only good, abstain from all sins and purify one's mind. 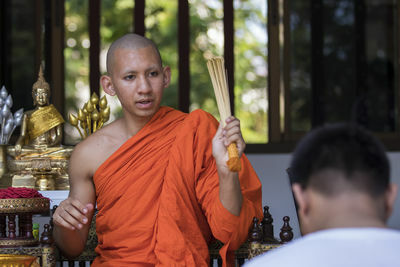 Followers take part in different religious activities, such as listen to sermons, pray, meditate and provide monks with food and other offerings. 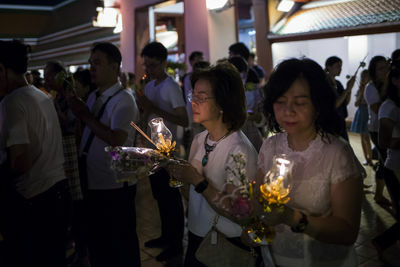 One of the most well-known rituals on this day is the candlelight procession, where devotees walk around the temple three times. 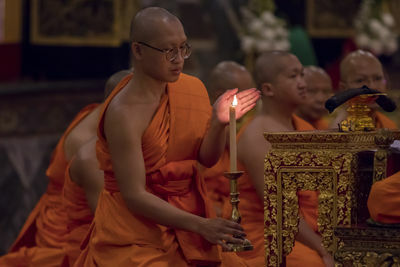 This religious celebration commemorates the day when Buddha ordained 1,250 monks and delivered pivotal sections of his teachings. This event is widely recognized as the beginning of the spread of the principles of Buddhism, a key day in the development of the religion. 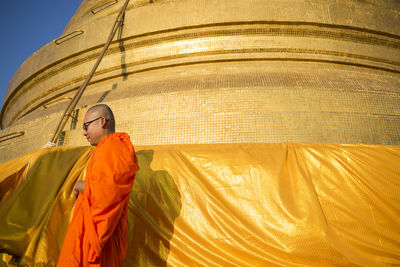 A monk walks around Wat Saket's golden stupa. According to Buddhist beliefs, monks and devotees need to walk clockwise for at least three times. 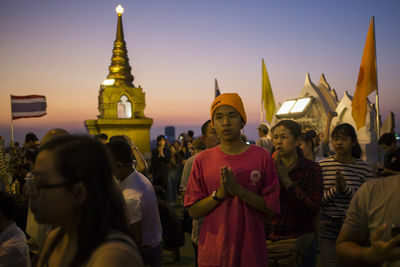 Worshippers walk around Wat Saket's golden stupa after sunset. According to Buddhist beliefs, devotees need to walk clockwise for at least three times. 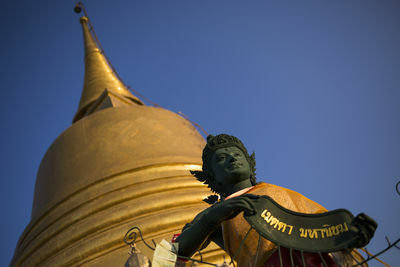 A monk stands at the base of Wat SaketÕs golden stupa during sunset. 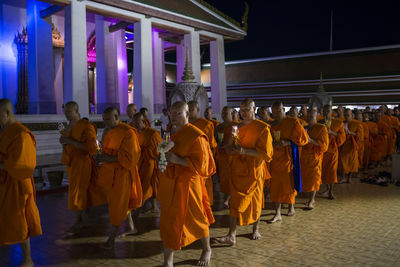 Monks and Buddhist followers join prayer ceremonies at Wat Saket' main hall. 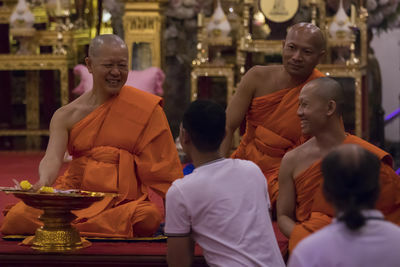 During Makha Bucha celebrations, followers take part in different religious activities, such as listen to sermons, meditate and provide monks with food offerings, among others. 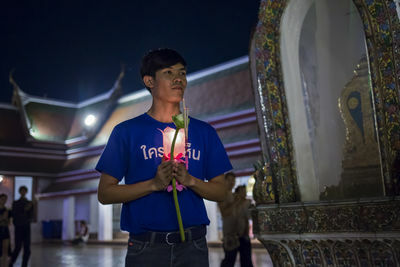 A Buddhist follower poses for a photo while carrying a candle at Wat Saket«s main hall. 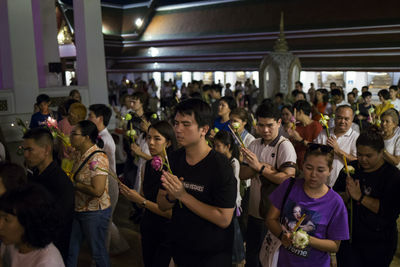 Devotees offer the candles to the monks to make merit. 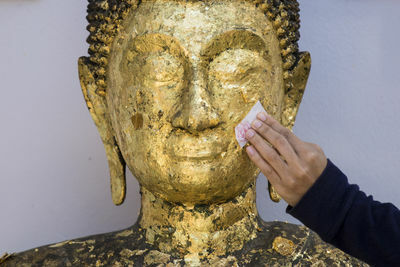 A Buddhist follower places a gold leaf on a Buddha statue to make merit and obtain good luck. 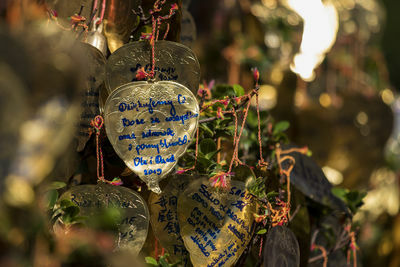 Devotees usually will put the leaf on places where they wish to heal or help. 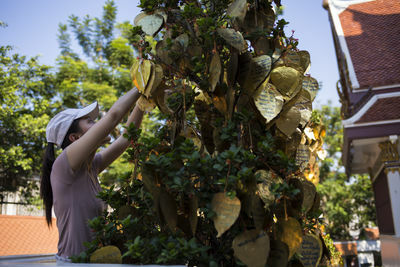 Golden metal leaves hang from a tree at the base of Wat Saket, or ÒThe temple of the Golden Mount.Ó Buddhists devotees write wishes on the golden leaves as part of the celebrations during the Makha Bucha day. 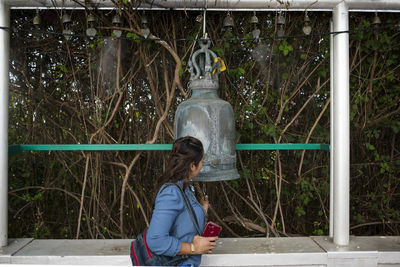 A woman hits a bell found along the path up to Wat Saket's golden stupa. 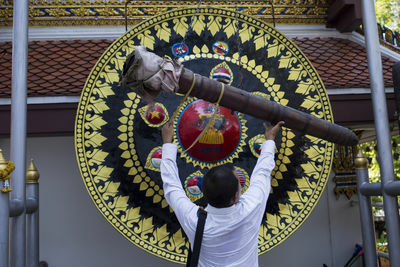 A man hits a gong found at the base of Wat Saket. 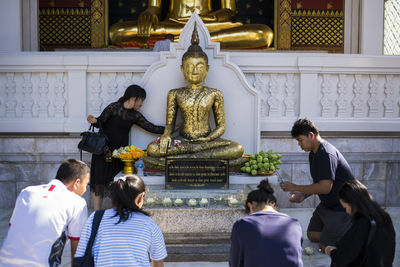 A statue located in front of Wat SaketÕs golden stupa. 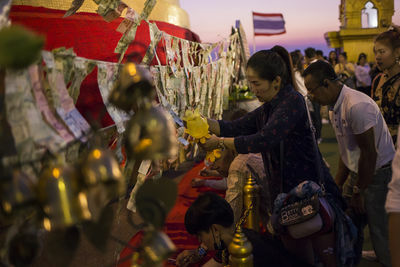 Worshippers pray and give offerings at an altar in Wat Saket. 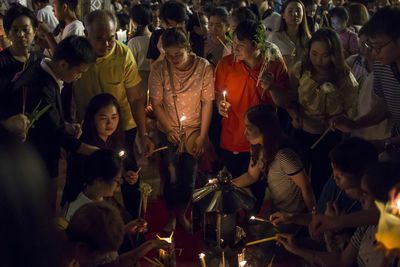 Worshippers join the candlelight procession at Wat Saket. 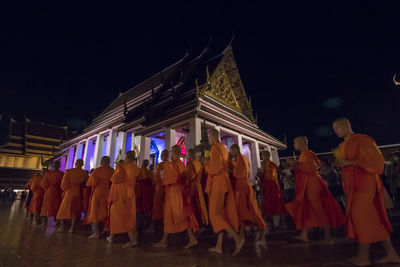 Devotees will walk clockwise around the main hall of the temple for at least three times. 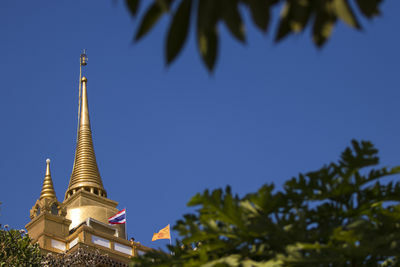 Wat Saket's golden stupa. This gilded Buddhist stupa, or chedi, is located at the top of the 'Golden Mount'. 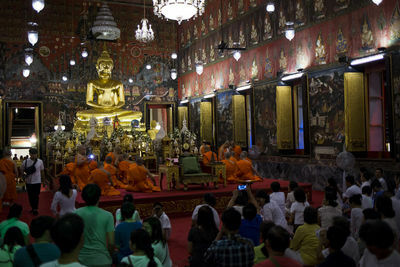 This temple is widely visited during the Makha Bucha, a Buddhist holiday celebrated in Thailand each year on the full moon of the third lunar month. 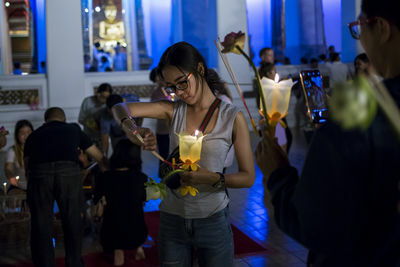 A woman prays at Wat Saket during Makha Bucha celebrations. 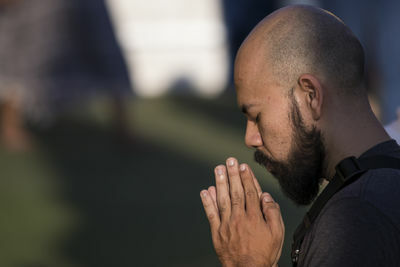 A man prays in front of Wat Saket's golden stupa during Makha Bucha celebrations. 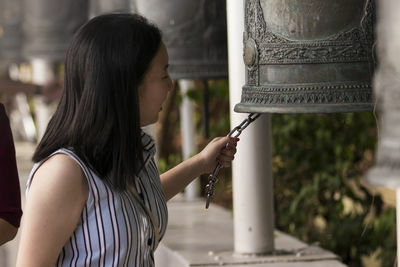 A woman offers a cash donation to make merit at Wat Saket's golden stupa. 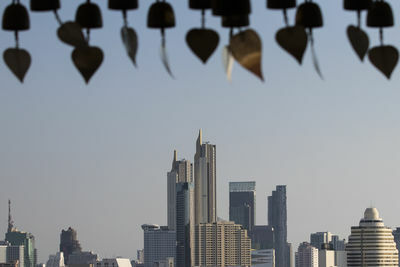 Metal golden leaves decorate Wat Saket with Bangkok's skyline in the background. 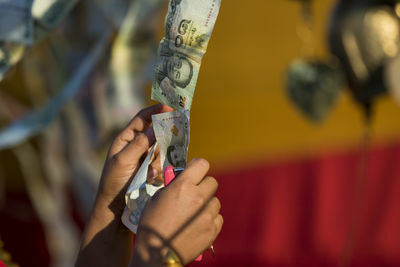 A woman prays and offers a cash donation to make merit at Wat Saket's golden stupa. 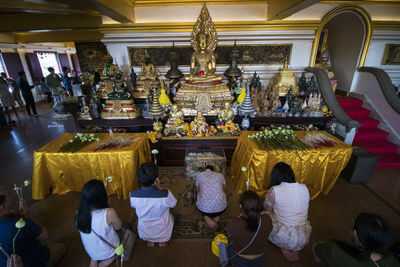 Buddhist followers pray in front of an altar at Wat Saket during Makha Bucha celebrations. 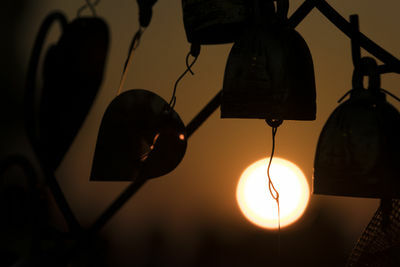 Sunset at Wat Saket's golden stupa. 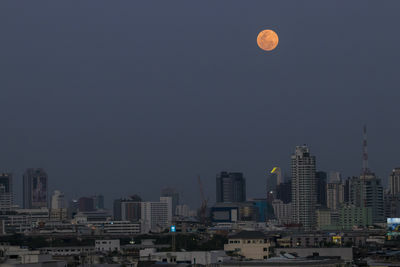 A full moon is seen over Bangkok during Makha Bucha celebrations. 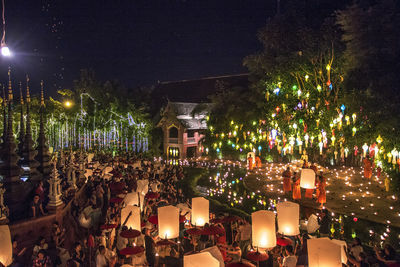 This Buddhist holiday is celebrated in Thailand each year on the full moon of the third lunar month. On this day, celebrated in temples (Wat) nationwide, Buddhists gather to show respect for Buddha and take part in merit-making activities. 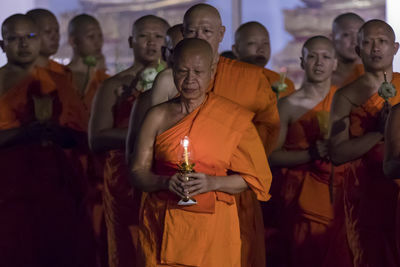 A monk holds a candle during the prayer ceremonies at Wat Saket' main hall. 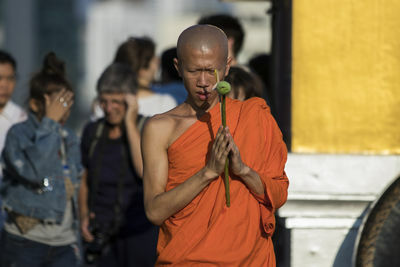 A monk blesses a devotee at Wat Saket during Makha Bucha celebrations. Wat Phan Tao Temple in Chiang Mai. At the stroke of midnight people release the floating lanterns into the air, and with them let go of their burdens and worries.